So, as you might already know, Labor Day weekend in New Orleans means Southern Decadence, one of the biggest, craziest gay festivals in existence. Fun is had by all, unless you’re really trying not to have fun, in which case, why are you there? 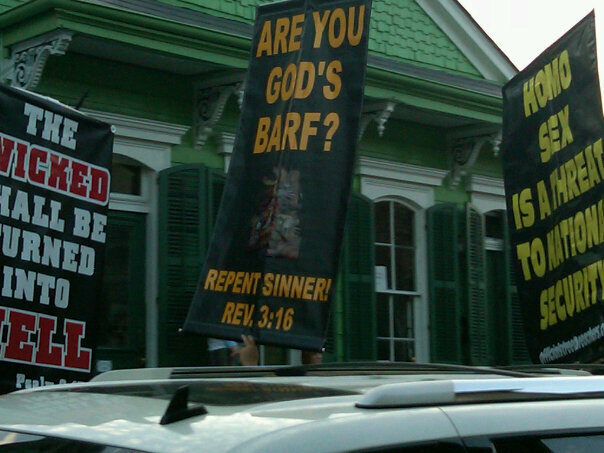 Anyway, as you might imagine, whenever a certain number of gays are gathered in the same place, another contingent tends to show up: the Christian protesters, with their loving signs! Great fun. Fake Christians, Abortionists, Jesus Mockers, Fornicators, Rebellious Women, MUSLIMS, Disobedient Children, Masturbators, Sport Nuts [what? ], The Prideful, Hypocrites, Crossdressers, Buddhists, Good People [even the Good People? ], Thieves, Inventors of Evil, Homosexuals [it took them that long to mention the fags? Do they know where they are? 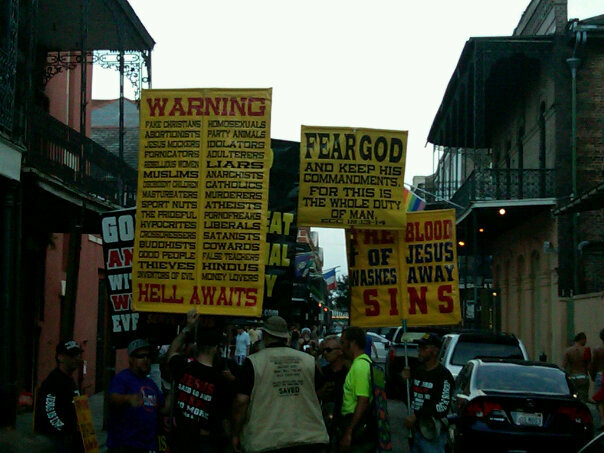 These people are obviously not Westboro-grade professionals], Party Animals [specifically Parker Posey], Idolators, Adulterers, LIARS, Anarchists, Catholics, Murderers, Atheists [can’t get me if I don’t believe in you], Pornofreaks [that’s a cool compound word, I think], Liberals, Satanists, Cowards, False Teachers, Hindus, and Money Lovers. Idiots forgot the Jews. How the hell did they forget the Jews? Why no, I am not, and neither are my friends who took this, but thank you for axing, have a nice day? These people. Sheesh. At least they’re entertaining.